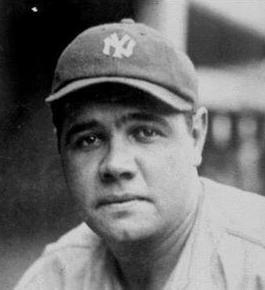 All across the USA, every Red Sox fan knows, that the Curse of the Bambino kept the team from winning a World Series for 86 years–or so they say–a curse broken in 2004. But who or what broke it? How could it be, that the spirit of Babe Ruth was overruled? Here, in 2007, on the 50th anniversary of the publication of Jack Kerouac’s On the Road, we get our explanation. And along the way, two more mysteries get explained: (1) what or who is the Ghost of the Susquehanna to which Kerouac refers in his most famous book and (2) why the Red Sox fans sing Neil Diamond’s ‘Sweet Caroline‘ as a victory song. Kerouac epitomized America on the move, taking his game with him just as the country took its pastime from one coast to the other. He measured his life by the accomplishments he could check off from one World Series to the next, but he could never have imagined that the Denver neighborhood offering a ballgame beneath the gas light and rekindling the joy of childhood sandlots would one day host a Fall Classic featuring his beloved Red Sox up against Neal Cassady’s Colorado Rockies. And wouldn’t he have loved the Lowell Spinners, the Red Sox farm team established in 1996 in Lowell Massachusetts, Kerouac’s birthplace and town of his boyhood. 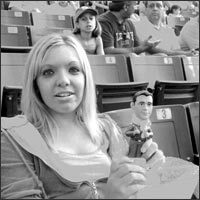 And in August 2003, the very year before the Curse of the Bambino was lifted, the Spinners honored Kerouac and his love for baseball with a bobblehead doll. Jack, the boy from just across the river that LeLacheur Park faces from its banks, was in the stands. The bus roared through Indiana cornfields that night; the moon illuminated the ghostly gathered husks; it was almost Halloween. . . . I cut right along. I wanted to get home. It was the night of the Ghost of the Susquehanna. Is it a coincidence, then, that the Susquehanna rises as the outlet of Otsego Lake, two blocks from the National Baseball Hall of Fame in Cooperstown, where a man named Lowell, now, will become immortalize? Or a coincidence that Boston Red Sox fans sing Neil Diamond’s “Sweet Caroline” as a victory song, diamond as in baseball diamond, Caroline being a variance of Carolyn, as in Carolyn Cassady, Neal’s wife with whom Kerouac had an affair, and Neil being a variance of Neal Cassady? Isn’t Kerouac saying that the “I” of Sal Paradise was at those games?